Welcome to the website of Niebisch & Tree Harps. We are a London based company. We have been making and selling harps for over thirty years. We cover all aspects of concert harp repair, restoration and servicing including emergency call-outs. As well as servicing and repairing all makes of lever harp. 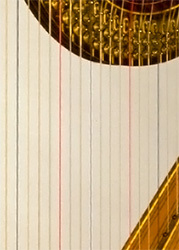 We have extensive experience with all makes of harps, from the 18th century to contemporary instruments. We service all makes and models of harps (Salvi, Horngacher, Lyon & Healy, Erard, Venus, Aoyama, etc.) regulating to within very fine limits checking and adjusting all parts of the harp and lubricating if necessary. We also service all makes of lever harp. 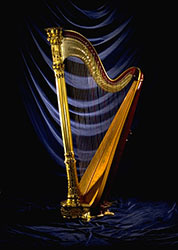 We specialise in all harp repairs from replacing necks and sound boards to re-gilding and all types of action repairs. Detailed quotes for accident repairs are provided within 24 hours of inspecting the harp and we provide a free basic valuation service. We make and sell our own design lever harps as well as second hand harps of any description. We often have a good selection to choose from. Please view the New and Used Harps pages for what is currently available. On site harp servicing is a service that we offer for those who cannot travel or if there are a number of harps requiring work. We come to the harp and carry out a complete service (including pedal wrapping and regulation) as if it had been in the workshop. We stock Bow brand natural gut harp strings and wire basses as well Pirastro bass harp strings.